The baseball is an amazing plaything. We can grip it and hold it so many different ways, and even the slightest calibration can turn an ordinary pitch into a weapon to thwart the greatest hitters in the world. Each pitch has its own history, evolving through the decades as the masters pass it down to the next generation. From the earliest days of the game, when Candy Cummings dreamed up the curveball while flinging clamshells on a Brooklyn beach, pitchers have never stopped innovating. 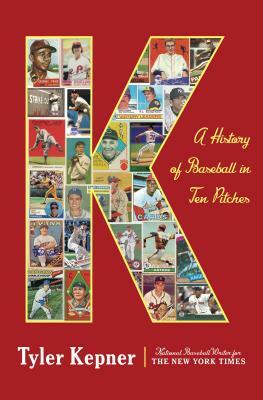 In K: A History of Baseball in Ten Pitches, Tyler Kepner traces the colorful stories and fascinating folklore behind the ten major pitches. Each chapter highlights a different pitch, from the blazing fastball to the fluttering knuckleball to the slippery spitball. Infusing every page with infectious passion for the game, Kepner brings readers inside the minds of combatants sixty feet, six inches apart. Filled with priceless insights from many of the best pitchers in baseball history including twenty-two Hall of Famers--from Bob Gibson, Steve Carlton, and Nolan Ryan to Greg Maddux, Mariano Rivera, and Clayton Kershaw--K will be the definitive book on pitching and join such works as The Glory of Their Times and Moneyball as a classic of the genre. TYLER KEPNER started covering baseball as a teenager, interviewing players for a homemade magazine that was featured in The New York Times in 1989. He attended Vanderbilt University on the Grantland Rice/Fred Russell sportswriting scholarship, then covered the Angels for the Riverside (Calif.) Press-Enterprise and the Mariners for the Seattle Post-Intelligencer. He joined The New York Times in 2000, covering the Mets for two seasons, the Yankees for eight, and serving as the national baseball writer since 2010. "Tyler Kepner knows his stuff—by which I mean the plethora of possible assaults on the strike zone that have created the modern game: splitters, spitters, sinkers, sliders. It’s all here: Cy Young’s whistler; Sandy Koufax’s 12-to-6 curve; the fadeaway that made Matty famous before it became a screwball and revived Warren Spahn’s career. K is an education in the history, mechanics and language of pitching and as rich with detail as the craft it describes. This is inside baseball at its best. A must read for any fan who aspires to be in the know." "[An] instant classic. . .[Kepner] deftly weaves all these voices into a seamless narrative. . .K is even better than I'd hoped, and I suspect it will now take its place on all the lists of essential baseball books." "Kepner puts a new spin on baseball's history that will have even the most avid fans entertained as they learn something new in each chapter." "A gripping tour through the most elemental component of baseball... Kepner has worked magic." "I've been a student of pitching for more than 40 years, and Tyler Kepner has captured the essence of the craft with fascinating stories and insights on every page." "One of baseball's enchanting oddities is that the action begins with a member of the defense holding the ball. Tyler Kepner has written a mind-opening explanation of what happens next. Chock-full of anecdotes and insights, his book is a masterful dissection of the art at the heart of the game."